Silt fence is a very economical and efficient way of containing silt runoff from a site. The correct installation is crucial in the effectiveness of the silt fence system. We offer the installation of various types of silt fence. The most common color for silt fence is black but we offer silt fence in orange as well and can be used in any of the applications below. The following are the most common types used but we can build any type that is specified in your plans for your project. “Typical Silt Fence” – This silt fence is 3’ in height and is always trenched into the ground -/+ 6”. It will be supported by 1”x1”x4’ hardwood stakes at 8’ o.c. Stakes spacing will be closer when a high flow area might be present on site. The silt fence is securely attached to stakes with ½” staples in each stake. In some cases, the 1”x1” hardwood stakes are replaced with 2”x2” hardwood stakes to make this fencing system even stronger. “Plastic Mesh Supported Silt Fence”(Mesh Fence) – This silt fence is basically the same as the “Typical Silt Fence” but has a heavy duty plastic support mesh on the back of the fence. The plastic mesh is also stapled to the same stakes as the silt fence itself. This support mesh offers more strength and support to the silt fence. “Wire backed Silt Fence” – This silt fence is also trenched 6” and is usually supported by 2”x2”x4’ hardwood stakes at 8’ o.c. The fence is backed with a wire mesh netting that is 36” in height and is similar to chicken wire. The silt fence and wire are attached to stakes with ½” staples and 2-3” round galvanized stress plates. The plates are fastened to the stakes with 1 ½” screws to secure the wire and silt fence fabric to the stakes. “Heavy duty Wire-backed Silt Fence” (FX Fence) – This is a very rugged and long lasting silt fence system. We use a heavy duty wire mesh backing that is 39” in height and is supported by 2”x2”x5’ hardwood stakes which are generally spaced at 8’ o.c. The heavy duty wire and silt fence are trenched 6” and are attached to the stakes with ½” staples and 3-3” round galvanized stress plates on each stake. The plates are fastened to the stakes with 1 ½” screws to securely hold the silt fence fabric and wire to the stakes. This is a great system for a long duration project because it requires little to no maintenance to be done and does not biodegrade in a short time. Hay bales and straw bales are also used for methods of erosion control systems. Hay bales and straw bales serve the same purpose for erosion control. These bales are wrapped with two lengths of 1/8” twine to securely hold them together. A bale typically has dimensions of +/- 16” in height, +/- 18” in width and +/- 36” in length. "Staked Bales" – Bales are generally installed on existing grade and butted tightly together as to not leave any space for flow between the bales. They are placed on the “cleared” ground so as no obstructions are allowing water to free-flow underneath the bale. Bales are then staked with 2-1”x1” hardwood stakes in each bale to hold them securely into place. Sometimes a double row of staked bales are installed to ensure protection in any high flow areas. In this case, the seams in between bales are staggered to allow proper protection. "Trenched Bales" - Sometimes bales are required to be installed in a trench. The trench is dug to the width of the bale and the bale is then placed in the trench and installed similarly as regular staked bales. The bales are then backfilled to prevent flow from going underneath the bale. "Staked Bale with Silt Fence" – Hay bales are very often installed in conjunction with silt fence. The silt fence is first installed and then the bales by one of the above methods. Bales can be used with any silt fence application on a construction site. Silt fence and hay bales are the most popular means for an erosion control barrier and are proven time and time again on jobsites everywhere to contain surface erosion and runoff. 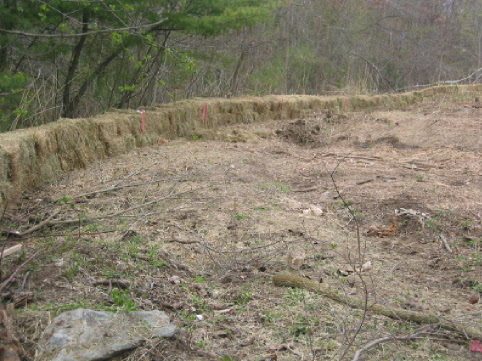 "Straw wattles" are another method of an erosion control barrier. They are basically a “tube” filled with straw.The “tube” is made of a plastic netting material that is filled with a weed free mixture of straw. Wattles are available in different sizes with the most common being 9”x25’ and 12”x20”. Wattles are generally installed on existing grade and staked with 1”x1” hardwood stakes at 4’ on center and at the beginning and end of each wattle. Wattles are more often than not, installed in conjunction with out silt fence systems. The silt fence is generally installed first and then the wattles are placed along the “upland” side of the silt fence and securely staked down. 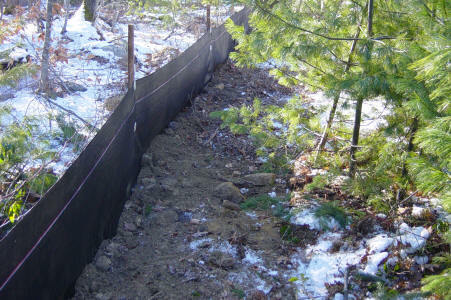 Safety fence and snow fence are often used in conjunction with our erosion control barriers or even by themselves. 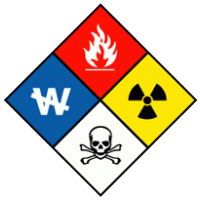 They are used to bring attention to your system or work area. They are also sometimes used to keep people or animals out of a site or for tree protection means. “Plastic Safety Fence” - can serve many purposes on a jobsite. Our safety fence is generally 4’ in height and comes in orange or green color. The fence is supported by 5’ hardwood stakes at +/-10’ o.c. and attached to these stakes with ½” staples. The fence is made from a highly visible plastic mesh netting that is UV resistant. This plastic safety fence is the most popular economical and efficient means to bringing attention to your site or work area. “Diamond Link Safety Fence” - is another type of safety fence. It is slightly heavier than the plastic safety fence but is not as visible. This fence is made of diamond shaped plastic squares and is typically installed with 1”x1”x5’ hardwood stakes at +/- 10’ o.c. The fence is attached to the stakes with ½” staples. “Snow Fence” – Snow fence is a wood slat fence that is 4’ in height and bound together with steal wire. The fence is usually supported with 5’ or 6’ medium duty metal stakes placed +/- 10’o.c. The fence is securely attached to stakes with the metal tabs on each stake. This fence is used to contain blowing snow on a job or for tree protection. Snow fence can also be used for a backing on the silt fence to give extra support in needed areas. Jobs are completed by highly trained individuals.